1 of 2 Heat oven to 375 degrees F. Place chicken pieces, skin side up (or remove skin, if desired), in a 9 x 13-inch baking pan. 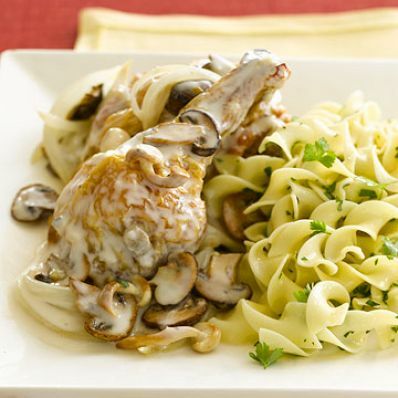 Cover chicken with sliced mushrooms and sliced onion; set aside. 2 of 2 In a medium bowl, stir together cream of mushroom and garlic soup, white sauce, lemon juice and garlic. Pour over chicken and vegetables in dish and cover with foil. Bake at 375 degrees F for 45 minutes. Cool slightly before serving.